Rotork Gears has supplied specialised declutch manual override gearboxes on swift delivery for a damper drive retrofit upgrade project at a large municipal power plant. Twelve ILG-D gearboxes were delivered within four weeks by the Rotork Gears Houston facility for attachment to K-Tork pneumatic vane-type actuators installed at an 1850MW coal-fired power plant in New Mexico. The applications mainly involve induced and forced fan combustion control. Installed in four groups of three, the gearbox design has enabled the handwheels to be suitably positioned through 90º quadrants to accommodate obstructions and for ease of operation. Rotork ILG-D gearboxes are specifically designed to provide a reliable means of manually overriding double-acting pneumatic valve actuators in power and process applications. Mounted between the actuator and the valve or damper, the gearboxes employ a declutch mechanism to disengage the handwheel drive during pneumatic operation. The full range of Rotork ILG gearboxes offer a rugged solution for spring-return or double-acting pneumatic actuation applications with output torques up to 32,000Nm (283,520lbf.in) in an ambient temperature range of -20 to +120ºC (-4 to +250ºF). Standard environmental enclosure ratings are IP65 and IP68. 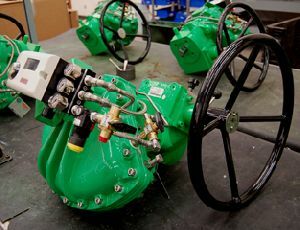 This contract is an excellent example of how Rotork group companies can combine to provide the best technical and commercial solutions for flow control applications.